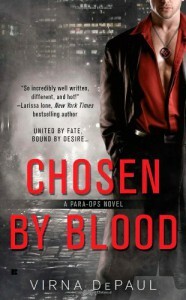 Chosen by Blood has a little bit of everything in it-love, betrayal, honor, and well you name it and it's in here. This is one of those books where there is a lot of information brought to us in the first half of the book, and it should have been confusing-but it wasn't. The world building was excellent-I felt like I was living in the world that the characters were in. This book takes place 5 years after the Second Civil War in which the Otherborn (think vampires and the like) came out of hiding. The government was scared and created a vaccine that made humans blood icky for vampires to taste. In doing so though, they created havoc in the vampire world because now they have almost no way of eating, so they are slowly starving to death. To right their wrong, the government decides to fix their mistake and come up with a vaccine to reverse the other one. There's just one problem: the vaccine was stolen and the government wants it back. They form a Para Ops team that has two humans, a wraith, a shape shifter, a mage and is lead by a vampire-Knox. I just loved everyone on the team-they are smart asses, and can hold their own in a fight. The women are just as strong as the men are-each one though has a problem they are dealing with that made me be able to relate to all of them. While Felicia and Knox made a great couple-this book read more like an Urban Fantasy then a Paranormal Romance (which is how my library has it marked) to me because while there is a romance, it's not all consuming. A large part of the book is about the team finding the cure, but I liked how it all intertwined to make a very good story-and one that touched on a lot of different topics, like how the members of the team felt like they didn't quite belong in society and were trying to find a place in it for themselves. The only problem I had was that at the end of the book Felicia just seemed to be very different from the beginning and I can't exactly pinpoint why. She was still strong, but it was like she was trying to do too much (I can't say what because I don't want to spoil it) with little regard to herself. I thought I would really have a problem with the fact that Knox's wife who died was Felicia's best friend, but I didn't. I really liked that part of the story because it showed the internal struggle of both Felicia and Knox and made them that much more likable. I thought that this was a really great start to a new series, and liked how the characters of future stories were introduced but didn't take over the entire story-we were given just enough to leave us (or at least me) wanting more of all them. I can't wait to see how this series progresses!